If you will allow me to pontificate and tell my tale about the valley of discontent and how understanding leverage is the key to business success these days. I see a technology world polarized between very small, laser focused businesses on one hand and on the other very large businesses that can take advantage of volume. Unfortunately, the in between area (the valley of discontent) is not a place that you really want your business to be. Why? Because if you are not working to be as lean and focused as possible or growing to a large size then sooner or later you just won’t be able to compete with those that do. As the water in the valley rises, unless you are on either side you are going to get swept away. Many technology resellers believe in the managed services (MSP) model. However, the days of good revenue there are fast waning. It is a race to bottom where price is the most important ingredient for customers. To survive you really need the advantage of size and I am not talking about a handful of good clients I am talking about hundreds, if not thousands. With those sorts of numbers you can leverage low cost items and still survive but without the volume you won’t. Most resellers are now not only directly competing with large wholesale technology stores but also with direct Internet sales. Again, if there is not the volume then there is decreasing advantage. Most resellers are ‘jack of all trades’ which was very successful for many years but not any more. Unless you can afford to establish a help desk service, provide contracted supported (with almost round the clock support and Service Level Agreements (SLAs)) you are going to lose out to those larger businesses that can. In short, if you want to maintain the ‘jack of all trades’ model then the path out of the valley of discontent is to get bigger, much bigger. This comes with its own set of challenges. The other pathway out of the valley of discontent is to do less, pick a niche and stick with it. This comes with its own set of dangers and challenges but essentially is probably going to mean abandoning stuff that your business now does and potentially that it does well. Only the items that generate the most profit are the ones a smaller business can maintain if they are to succeed. There is little room for stuff that isn’t profitable on this side of the valley, whatever you do you have to do better than everyone else and charge accordingly. Those that don’t understand the fact that they need to make either of these choices are the ones who will pay the greatest price. Why? Because others are going to force it upon them. Let’s take this whole ‘move’ to the cloud paradigm we are currently experiencing. One of the selling points of Office 365 for example is the ability to earn recurring revenue through being the ‘partner of record’ for an account. This is means that the ‘partner of record’ receives 12% for sign up and 6% recurring for the Office 365 licenses sold. To make these kind of fees worthwhile, again you have to have volume in many hundreds if not thousands. There are other revenue opportunities around the Office 365 products but at this point in time most clients simply want hosted email and not much else. That will change over time but at this point in time most resellers aren’t skilled and experienced with products like SharePoint and Lync to generate revenue opportunities. Is that their fault? In some ways yes but again they are generally in the valley of discontent without enough leverage to cope to make change. Many vendors are now billing clients directly and only paying a ‘commission’ to the traditional reseller. There is certainly money to be made here and many businesses do it successfully but it requires volume pure and simple. To me it is again aimed at the ‘bigger’ resellers. Why? Firstly, the fees for the competency are USD$ 1,850 for Silver and USD$ 3,800. That is big hike from previous small business programs. I also note with interest that the two Office 365 exams, 70-321 Deploying Office 365 and 70-323 Administering Office 365 are pretty much mandatory for both Silver and Gold levels. From my experience with these exams I would struggle to think of one other person I know in the small business technology community that would pass these. That isn’t to say they couldn’t but the expectation in the small business community is that you can more or less pass an exam if you work with the product every day. If these Office 365 exams remain unchanged from when I saw them then small business resellers are going to have to put in a lot of work coming up to speed with enterprise features they may never see in the real world. That is not really going to encourage them to invest the time. Like it or not, if they want to achieve the competency they are going to have to make that investment. They question is, are the majority in a location in which they can? If they are in the valley of discontent, probably not. From what I also see the Gold level requires at least 2 qualified employees. Most resellers I know in the SMB space are small and may not even have 2 employees. If they do, retaining two suitably qualified employees is going to be a major challenge. Again, the advantages lie with larger business, those with the funds, those with the employees, those with the resources to get people through the exams. In a nutshell that’s why I tell people that they need to work out a way to get themselves out of the valley of discontent, from which I can only see the two options (but there maybe more), get big or get small and fast. A wise person knows they cannot control their environment only their reaction to it. The change in the technology landscape is certainly something many rail against but in the end it really does no good as it simply continues to change underneath you. I applaud those who are making decisions, evaluating the environment and moving their business to places where they will be successful. Likewise, I implore the others to take a serious look at what is happening around you and how little control you have over it and start making the move to either bank. Failing to do so will not end well I fear. The 25th of April is an Australian national day of remembrance for when Australian and New Zealand soldiers landed at Gallipoli. Many see this day as the birth of our nation. It is always heartening to see the growing respect for those who served and continue to serve our country. 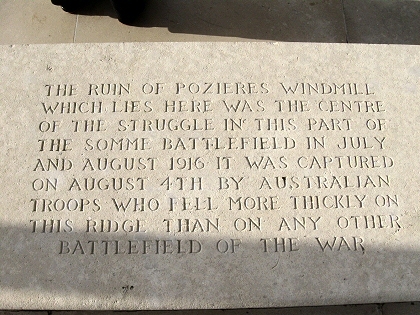 I have been fortunate to have visited the Australian Battlefields of northern France and was so inspired that I created a web site www.anzacsinfrance.com to commemorate this history of those that fought in that theatre but probably haven’t received the recognition they deserve. The above example of the sacrifice at Pozieres is just one such example. The best comparison I can make is that during the 8 months Australians fought at Gallipoli there were 9 Victoria Crosses awarded (the highest military recognition for bravery). In the last major engagement Australian troops were engaged in 1918 on the Western Front at Mont St Quentin 8 Victoria Crosses were awarded in a battle that lasted but a few days. What was achieved during this engagement was something that is truly remarkable yet most Australians have never heard of it. Gallipoli has become the focus of ANZAC day and now more so the battle of Villers-Bretonneux (on ANZAC day in 1918) which is great to see. However, once you start examining the history of the battles that Australians fought in all over the world and during all different conflicts you discover some truly amazing stories. So, for all those who served and never returned, those that served and returned to help build Australia and those still serving in our countries interest, all we can do is say thanks and promise to never forget. In this episode I speak with Powershell MVP Shane Hoey from QLD about Powershell and Lync. If you have ever wondered what Lync is and how it works on site or via Office 365 this is the episode for you. Full disclosure – I received a copy of this book for free in exchange for reviewing it. I think it is always hard to position a book that is a compendium of other books and it is so with this one. Firstly, you’ll need to be a SharePoint developer who uses Visual Studio to get the most from this book. You’ll also need to be looking to extend the functionality of SharePoint onto the Windows Phone platform. Given the combination of these audiences it is clear that this book is not for everyone. The book certainly does allow you to get a feel of the works of the authors from whom the individual chapters have been taken. It will also provide you benefit in the specific subjects that it covers, however you should check these area carefully before investing in the the book as each chapter is somewhat separate from the next. The chapters certainly contain a wealth of information on their topics and would provide good value for those looking to learn about them, however as I said you will need to be a developer who is comfortable with using Visual Studio and SharePoint to get the most from this work. An exception or type System.Data.SqlClient.SqlException was thrown. Additional information: Coudl not find stored procedure ‘sp_adoption’. As http://msdn.microsoft.com/en-us/library/hh231665.aspx points out you need SharePoint Service Pack 1 prior to using SQL 2012. Now that’s all well and good but there is currently no download of SharePoint Foundation 2010 WITH Service Pack 1. So how do you go about doing a clean install of SharePoint Foundation onto SQL 2012? Bottom line is, at the moment you can’t really. The best bet is to get SharePoint Foundation 2010 working on SQL 2008 R2 Express. Then you need to apply SharePoint Foundation Service Pack 1 and THEN you need to upgrade SQL to SQL Express 2012 using an in place method. I also suppose that it is possible to install SharePoint Foundation 2010 and not run the configuration wizard, install SharePoint Foundation 2010 Service Pack 1 and then proceed but that is very, very messy. Bottom line? It looks like we have to wait until SharePoint Foundation 2010 with Service Pack 1 is released before there is a clean installation option with SQL 2012. So what advantages does SQL 2012 Express provide over SQL 2008 R2 Express? Not much I can see. It still has a 10GB database and 1GB RAM limit. So, if it was me, I wouldn’t be rushing to upgrade SharePoint Foundation 2010 to SQL 2012 Express just yet. It illustrates to me the fact that many so called ‘IT people’ have already formed options about Office 365 without ever having used the product. I wonder on what hearsay the above person bases their opinion? I would suggest that it has probably come from a few ill-informed naysayers but interestingly that has proved to be enough to sway this individual. I am not saying that Office 365 is perfect, far from it, but really what IT is ever perfect? However, I would contend that Office 365 does work and works very well for many many people. Importantly, Office 365 is more than hosted Exchange it is Lync, SharePoint and Office Professional Plus. Even more importantly, it offers enterprise features such as legal hold, hybrid co-existence and so on that few other providers offer. Their argument is already defunct because they are unable to compare products like for like but yet they continue to scream the failure of products at the top of their lungs. Worst of all they haven’t even taken the time to examine something they are criticising. How can their opinion hold any validity at all in those circumstances? They have criticised a product and in the same breath admitted they haven’t even used it? Am I the only one that see a massive credibility gap where? It always amazes me how parochial so called ‘IT Professionals’ get about certain technology and not just in relation to cloud computing. Whether they be Apple “fanbois”, Linux devotees or gooey eyed Windows zealots, the common thing about all of them is that they represent a teeny tiny percentage of the technology market. However, they defend their beliefs with such fanaticism that it beggars belief sometimes. Analysis would reveal that these very zealots are afraid, they are afraid to admit they might be wrong. If what you are saying is so good why is there a need to defend it so vigorously? It should speak for itself shouldn’t it? The more choice we have the better for it spurs competition and creates improved products. There is very little chance that a single product from a single supplier can solve everyone’s needs. So rather than deriding the competition with emotional vitriol examine the products rationally and professionally and guess what? You may even learn something about the competition that can help you. You may even find there is a business opportunity for their implementation that could, shock horror, even generate revenue! Such individuals are far more interested in being ‘right’ than running a business. They are entitled to their delusion I suppose. Such statements unfortunately remind me that we still live in a world with small frightened technology ‘unprofessionals’ who are too scared to admit that they might not know something and more so, might be struggling with the change that is transpiring in the market place. What’s the saying? Empty vessels make the …..
Now all of this comes from a Microsoft funded survey of influencers at 3,000 SMB’s including some here in Australia. Now because it comes from Microsoft you do have to take the figures with a grain of salt, however the trends are still very interesting. This one aimed at the opportunity for the SMB reseller. Now, as I have mentioned many time here before I certainly believe there are plenty of opportunities for resellers BUT they are going come without some pain and re-alignment for these resellers. Take for example the figure that 65% expect to be using cloud based email services in the next 2-3 years. This means that there is going to much less call for a product like Exchange Server on site for SMB’s. It is also going to mean that ancillary services like message hygiene (spam and virus filtering basically) are also going to move into the cloud and away from reseller revenue streams. Conversely to that you also see figures there like 60% don’t have the resources to implement new technologies and applications. That is certainly an opportunity, however it also means that resellers who want to provide that need to get skilled up on these ‘new technologies and applications’. So an investment is required but it would certainly appear to be worth it. Perhaps what these sort of surveys do is challenge the perception. Take a look at the figure that only 20% believe their data is less secure in the cloud than it is in their on-premise system. That is certainly contrary to what you hear out there generally. What these survey’s do reinforce is that fact that there is still opportunity in the IT business no matter whether it is cloud based or not. Importantly however, cloud services are going to require some skills education, investment and development to reap the rewards. It is very unlikely that staying with the same old business model and the same old skills is going to provide you with more opportunity in the coming years. In the end you can take away from these surveys what you want but to me the important thing is to look at the trends that all these surveys point to. If you are not paying attention, chances are you’ll get left behind and have to struggle. Don’t say that you haven’t been warned! or from most other book stores like Amazon. 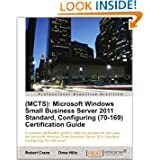 The book is aimed at helping those looking to pass the Microsoft SBS 2011 70-169 certification. Hopefully it is also a good reference source for those looking to get the most from SBS 2011. I’d like to thank my co-author Drew Hills for working with me on the project as well as the reviewers Susan Bradley, Boon Tee and Hilton Travis. The book is much better for all your input.